Well, when it comes to choosing a paint color for your interiors, I doubt if green would be the first choice on anyone’s mind. At least it will definitely not be on mine. However, there’s something about green wall color that evokes a feeling of nostalgia within me and I seem to be drawn towards it. A couple of days ago, I shared a post on why I love rooms with all white walls. And I still do but some of these pictures I’ve come across are making me feel, I might have another favorite. Would I paint the whole house in green? I don’t think so. However, I would definitely consider a small room or a vignette somewhere. I am more inclined to the darker and rusty shades of green like sage, olives, greenish grays, bottle green as opposed to the brighter and lighter shades. I love the character it is giving to this particular corner. Feels like the room is telling some sort of story. As soon as I saw this pic I thought it would be perfect for a photo shoot. The tall ceiling is creating a lovely backdrop. I would do a flower photo-shoot with pink and white peonies or some kind of clothing style shoot that involved a lot of lace and tulle. Love the vintage look of this one. It almost feels like the walls have grown moss over the period of time due to moisture and is taking me back in time. Everything about this is just perfect specially that bright orange wall art. There is so much drama created in this 1950’s designed room. 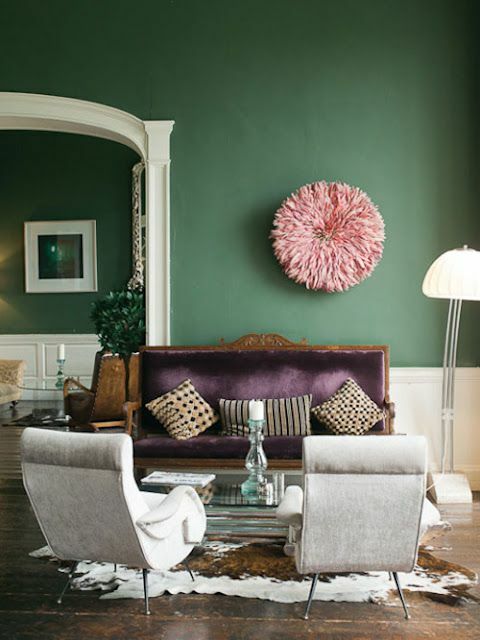 Love the warm pops of color with the dark green walls. This green is just so soothing to look at and instantly calms me down. The grey linen sheets are adding to the effect. Styling homes with all white rooms is becoming a trend these days, however there is still some apprehension around it. A lot of people do not consider white as a color. There is a belief that if there is no color hue means the walls are bare and a worry that the house may look unfinished. So today I wanted to share with you ‘13 Reasons To Love White Wall Rooms’. Also at the end there is a before-after makeover of a room, which shows what paint can do to transform a room. Many of you may have come across this term ‘Vignette’ also pronounced as ‘Vin Yet’ ! in home decor magazines or heard it on HGTV ( which is where I first heard it .. on dear genevieve! a show I loved). A vignette for a graphic designer could be like vine/leaf-shaped design used to separate chapters in books or for photographers it could be loss in clarity towards the corners and sides of an image. For an interior designer it means to create a small scene that focuses on one moment and gives an insight on the character of a bigger scene. In simple words , vignettes are moments created for you to pause! Many stores create these for merchandising their products. For e.g. If you go to a store like pottery barn or williams sonoma , you will see beautiful table settings which will make you want to but everything. We all have vignettes scattered in our houses . From a group of candles and a flower vase kept on the table top to the way you have arranged the mirror in your bathroom with rest of the goodies. These small moments help us to appreciate the beauty of the little things. We all have different collectibles in our houses right? things we have bought on our journeys abroad, gifts we have received, cute accents we have bought from etsy shops, mirrors, artwork, vintage chairs etc.. you get the point. But only when we put these things together in an artistic way is when we can really appreciate their beauty. The pictures below are some examples of vignettes I love. Left: The Navy wall creates the perfect backdrop for the accents. Right: Love this modular casing. Left: The combination of the antique mirror with the pink is great. Right: The pink juju hat on the green wall is to die for. Left: Love the simple shapes. Right: Simplicity is the key here. Left: Great book shelf. Right: Black,red and gold ! gorgeous color combo. Left: Focal point of the wall. Right: The pink and green chair is just creating a moment there. Hope you guys were inspired to see these as I was. See more beautiful Vignettes on my pinterest page ! More interior design posts, right here. Have a great week ya’ll ! Which artwork goes best with my room? Have you ever come across an artwork/painting which you really loved but then thought “where would this go?” “should I put this in the living room or bedroom?” art goes hand in hand with the rest of your home décor and helps set the tone of the room. As an artist myself i feel subconsciously we all gravitate towards art that clicks an emotional chord with us somewhere. Well i think that’s your answer! Go with whatever connects with you the most. You would probably face the same question above when you come across a piece of furniture or any other home accessories too. At the end of the day when you look back, you will see that that your home is actually the reflection of who you are. It builds up a character around the things you like and the stories you want tell. Here are pics of some rooms /spaces that I am going ga ga over. I love how the artwork in each of the rooms sets the mood and blends in with the rest of the décor. Oh and in case you are an art collector or just looking to buy some paintings in near future you should totally checkout this site called invaluable.com. They are one of the largest online auction marketplaces of fine and decorative arts, antiques, collectibles, and estate sales.